So, it’s now 4 months since we boxed our bikes, boarded our flight and landed back here in blighty- and 4 months since the ToddlerOnTour blog has seen an update! 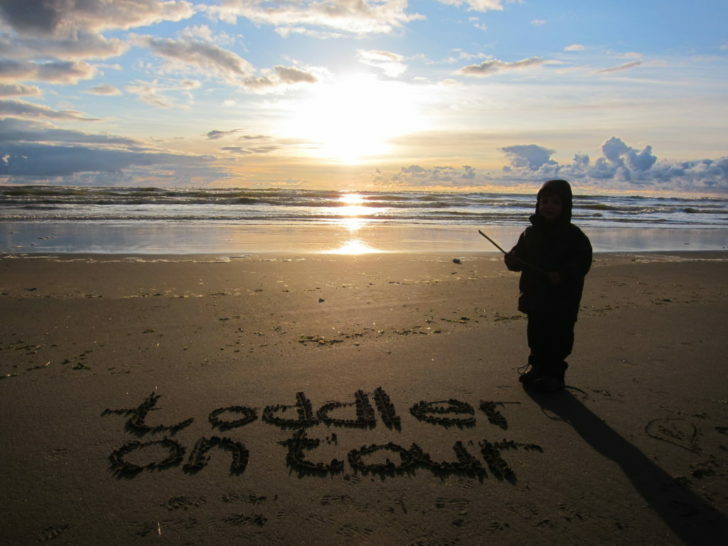 So, where are ToddlerOnTour now- and what are we doing? And just how does it feel to go from a life on the road and then back to ‘reality’? I’ve done a bit of reading around and realised we’re not the only ‘beginner travellers’ to undertake our first big adventure and then seemingly drop off the radar on our return. And it got me thinking- what actually happens when the dream was made a reality, and you’ve reached the end? What happens next? And why should we ‘disappear’ – if the first adventure is over, does that really mean this is the end? Arriving back was a real case of the bittersweet for us, and the months that have followed have seen their fair share of ups and downs. Our first hurdle was the simple fact that we had nothing to come back to. When we set off for our cycle tour, we gave up our jobs, ended the tenancy on our house and put our belongings in storage. We had no responsibilities while we were travelling, which was absolutely liberating- but it also meant we had no security on our return, and suddenly, the far-stretched road of ‘nothing’ that lay ahead of us seemed both terrifying and exciting. Where would we live? What would we do? When you’re used to having a plan and knowing what comes next, this sensation of being thrust into the unknown can pull the ground from under your feet- and feel utterly overwhelming. With no home to come back to, we needed to move in with family until we found our feet once more. The shift from being completely in control of our lives, living in the open air and moving around freely to invading someone else’s personal space was a dramatic loss of independence. We could only get the very basics of our belongings from our container and had a continual sense of being in limbo, sleeping in someone else’s bed, using someone else’s belongings. It’s hard to establish a new identity and life for yourselves when you’re dependent upon others for the basics of survival – and as such, we felt as though we had regressed significantly. We were enormously grateful and fortunate to have that safety net on our return, and couldn’t have survived without it, but nonetheless, it was tough for everyone involved. Touring cyclists with big dreams and ambitions to living with the parents once more- logic may argue otherwise, but it felt as though we’d taken a huge step back. Without our bikes- who is ‘ToddlerOnTour’? For months prior to our trip and then the whole duration of our time away, we had built a distinct identity and purpose for ourselves. Building the blog, networking with fellow travellers, making contacts on WarmShowers and Couchsurfing- for 8 months, we had been ToddlerOnTour, a cycling family, with a [rough] route and goal in mind, and a real sense of purpose. When we landed back in the UK, we lost our identity as a travelling family, and became ‘just us’ once more. Who were we? Were we still ‘travellers’, ‘cyclists’? Yes, we were still a family… but with no goals, no jobs, no plan. Where did that leave us? A lot of travel bloggers talk about the concept of reverse culture-shock when returning home. Even the small things we previously took for granted when living in the UK felt awkward or strange to us, and the sense of displacement, alienation and confusion were actually surprising. When you enter a new country for the first time, you expect there to be differences. You have to adapt to different languages, the different foods on the shelves of the local market, the customs or road traffic rules. You don’t expect to have to start back at the beginning when you get back home. I’ll be honest. The first time I got back into a car, I had to physically stop, rack my brains and systematically remind myself how to operate a vehicle. Roundabouts and junctions became a nightmare as I’d forget which side of the road I belonged on. And the first time I took a trip to the supermarket, I found myself stood in the aisle, staring at all these foods I used to know, and wondering which I even liked. It took me the best part of 2hours to negotiate that shopping trip, and I emerged with the strangest array of items that couldn’t even create a decent meal. After relying upon a single ring camping stove for so long, I couldn’t get my head around the idea of using an oven or how to cook multiple items at the same time. Not one after the other! Not all together in the same pan! It was something so mind-numbingly simple, something I took for granted before our trip… and yet now, it felt overwhelmingly complicated. The frustration at my incompetence reduced me to tears on more than one occasion. Why didn’t I ‘get it’?! Why was everything so hard? It seemed as though life back ‘home’ had continued in exactly the same way as it always had. Nothing had changed- nothing was different- we just hadn’t been a part of it. And we were just expected to slot back in, to be who we were before- no-one seemed to appreciate that we had changed. We had a great reception from friends and family, but at the same time, it felt as though no-one was really interested, or even particularly cared. People would ask in curiosity about our travels, but 5 minutes into an account of our experiences, eyes would glaze over. Many people wanted, or needed, a nice, tidy answer. They weren’t particularly interested in the details- or, if they were, I couldn’t find the words in me to translate such incredible experiences into something they could understand, or summarise everything that had happened over the 5months into digestible anecdotes. People were proud of us and admired our journey- but without having been there, it just felt as though they couldn’t understand the enormity of what we’d been through. Part of me felt invincible, incredible- I had cycled 3,500 miles! With a toddler! I had conquered mountains, I had survived the tail-end of a hurricane. I had lounged on the beach at Lake Tahoe watching fireworks for Independence Day; I had conquered my fear of motorbikes and quads as I raced through sand dunes at high speed. Somehow, it felt as though there should be some epic conclusion, or celebration of that fact. But no… we were simply ‘back’. But of course, it’s not all doom and gloom. All returning travellers- especially those who have been ‘roughing it’ along the way!- will identify with Amanda Kendle’s list of basics to appreciate once setting foot back on home turf. We could enjoy simple luxuries, like clean clothes. Without holes or tears in. Hot showers. Or a proper bed! And some things I had long-since learnt to live without managed to quickly slip back into the category of ‘essentials’ upon our return- like conditioner, or even readily-available tap water. We could enjoy being with our friends and family, which was especially great for Theo- who loved seeing his grandparents, aunts, uncles and cousins again. And we could stop, slow down, and simply try to take it all in. The pressure of finding accommodation, deciding routes or contacting hosts was gone. We could sit still for a while. We had reached the end- we were home. So, where are we now- and what are we doing? After getting ourselves together, Matt managed to very(!) quickly secure a job, which took off a great deal of the pressure. We found ourselves a rental property, and are now currently living just outside of Manchester, near to Matt’s new job as an SEO Manager. Theo has started at pre-school while I enter the whirlwind of graduate job-seeking, and against all odds, we’re slowly slipping back into the 9-5 lifestyle. We’ve decided to ‘settle’ a while, but alongside, we’re still planning future ventures and cycling tours- and we’ve kept our adventure alive by surrounding ourselves with photos and memories of the incredible adventure we undertook. Travelling remains our dream and we’ll continue to pursue it – but we’ve also come to accept that we have dreams and ambitions outside of travel. To try and find an identity for ourselves outside ToddlerOnTour- through our careers, through running and cycling and the experiences we share as a family. Can we have it all? Experience the satisfaction of building careers for ourselves, and enjoy the incredible experience of family travel alongside? Live a ‘normal’ life and travel too? As Amanda at A Dangerous Business demonstrates, where there’s a will, there’s a way. I’m not saying it will be easy- but there are many out there who find the balance. Perhaps we can, too. No. This is just the end of our beginning.